The Sauk County Historical Society’s centennial commemoration of the Man Mound in Greenfield Township, Sauk County, Wisconsin, was in all respects, a very successful event. 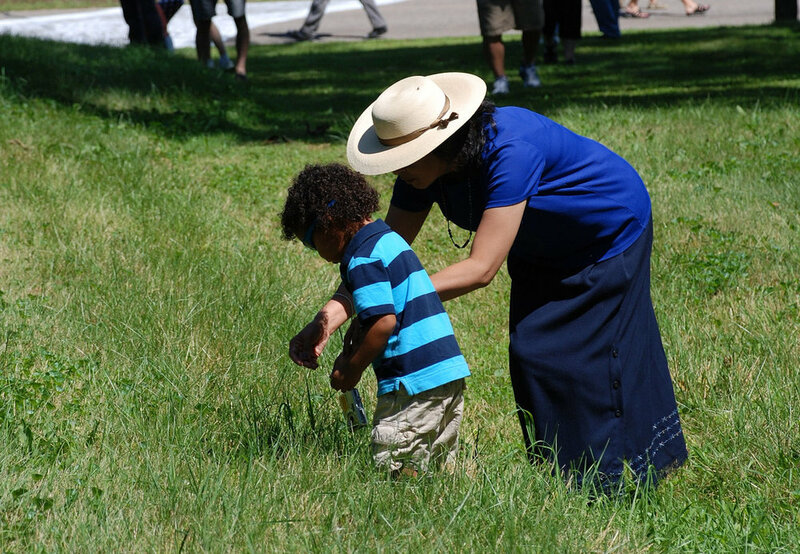 The weather was perfect, and approximately 275 visitors showed up to help celebrate this historic event. 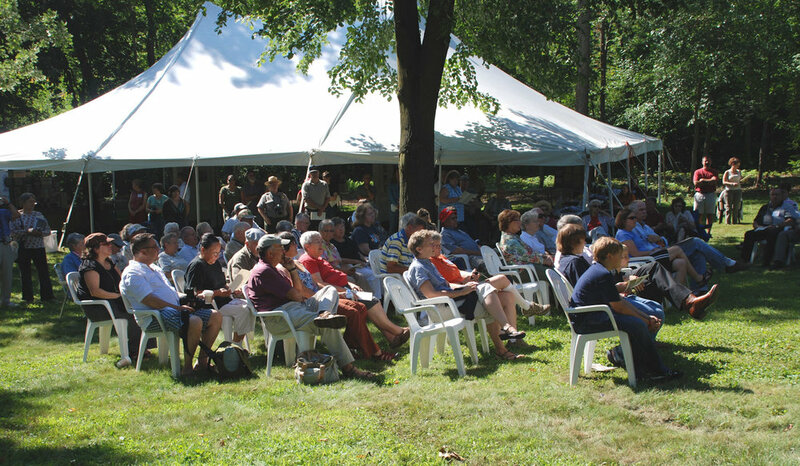 Under a large 60’ by 40’ tent, participants enjoyed a display of historic photos, books, maps, and artifacts. Visitors from as far away as Pennsylvania were present, as were many local residents, including some who attended the one-room Man MoundSchool years ago and played as children along the mound. Also in attendance were Wisconsin Rep. Doc. Hines, Wisconsin Senator Luther Olson, Mark Steiz representing Congressman Ron Kind, Brett Watson representing Congresswoman Tammy Baldwin, and Kim Cates representing Senator Herb Kohl. 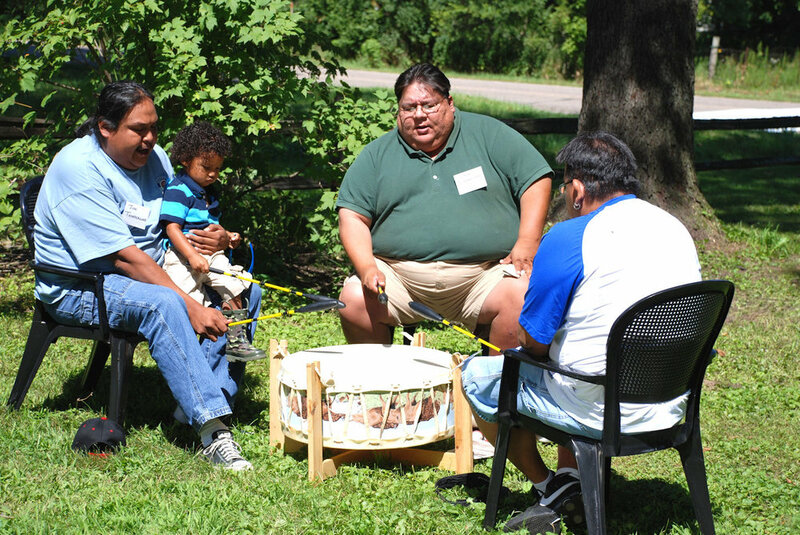 At 10 a.m., the crowd gathered before the stage for a 90-minute program of historic recollections, proclamations declaring August 9th Man Mound Day from the Ho-Chunk Nation, the Sauk County Board of Supervisors, and from Governor Doyle, reenactments, rededication of the memorial plaque, and a Native American honoring of Man Mound. Additionally, participants heard Congressional readings declaring the importance of Man Mound, both of which are now part of the House of Representatives and Senate Congressional Records. As a final gesture commemorating the Man Mound, visitors were asked to spread hands full of needle seed, native to Wisconsin, onto the raised earthen works built some 1000 years ago by Native Americans. 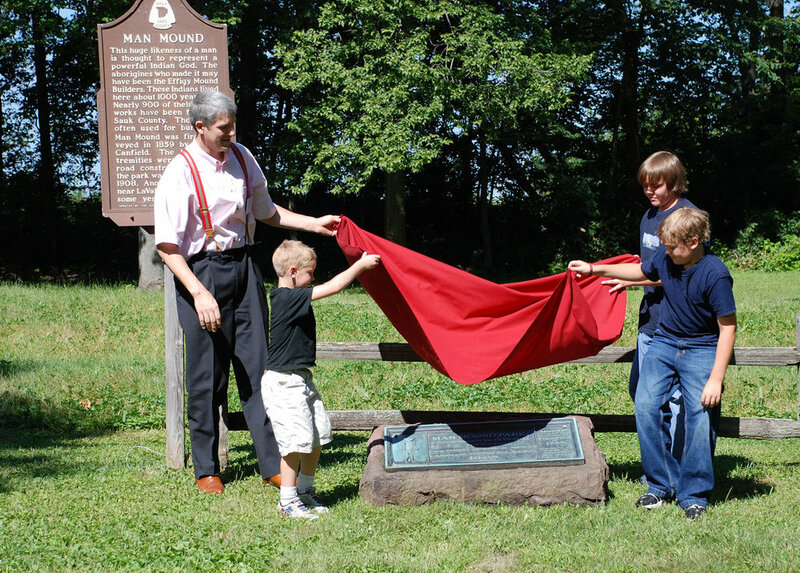 Lucas Van Orden and his sons unveil the plaque which his great grandfather helped erect in 1908. Several of the 275 in attendance pulled chairs close to the podium for a close-up view of the ceremony. The man with the horns lies in the grass, asleep. When he first lay down to dream in this place a thousand years ago, he measured 217 feet from the tips of his horns to the soles of his feet. But in 1907 they cut him off at the shins to build the road called in his honor Man Mound Road. Green amputee, his horns point north, uphill; once he walked west with the sun. On this cicada-heavy afternoon, though, sleep lies lightly enough upon him; when the wind rises, he drowsily flexes his rippling green muscles for me. The story goes that once long ago a buffalo bull rose from the waters of Devil's Lake. He changed his shape to a man's, and they named him Red Horn, because he killed monsters, of which there were plenty back then. He took a human wife. Then, having fathered the Buffalo Clan, he stretched himself out on this bellied hill, and sank into earthwork and dream. I lie down on his chest, and soon find myself embraced by furry green arms. Waking, I note that, due to the curve of the slope where he sleeps, there'sonly one way you can see his whole lanky body at once: by standing, of course, within the arch of those horns. Across the name-bearing road, cows stare and dream green bovid dreams.